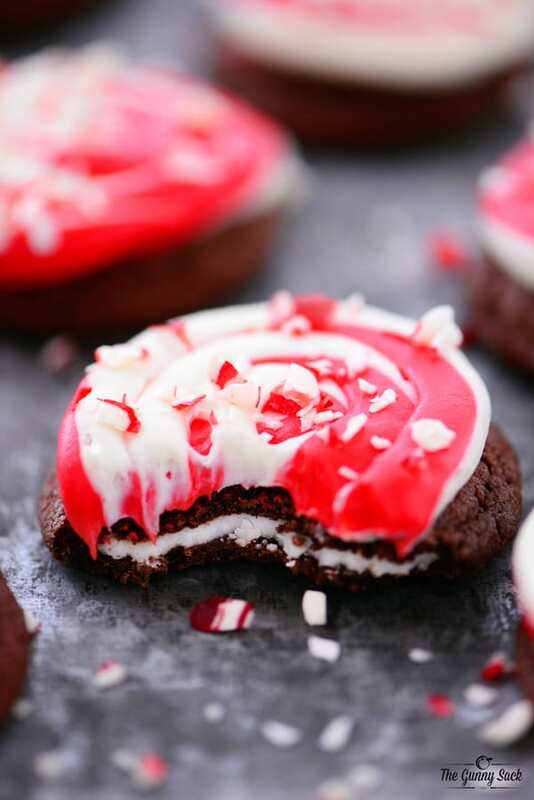 This Christmas cookie recipe for Chocolate Peppermint Stuffed Cookies, stuffed with peppermint patties, are sure to become a holiday favorite. 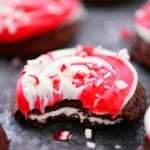 Disclosure: I am sharing this Chocolate Peppermint Stuffed Cookies recipe as part of my paid partnership with The J.M. Smucker Company. Of all the holiday desserts, I think cookies are the most baked, most popular dessert from cookies exchanges to cookie decorating parties, Christmas cookies are the best! I have so many great memories of Christmas cookies. My mom always made cut-out sugar cookies with us during the holidays. My grandma used to make pecan lace cookies. One of my best friends mom’s always made us peppermint meringue cookies. 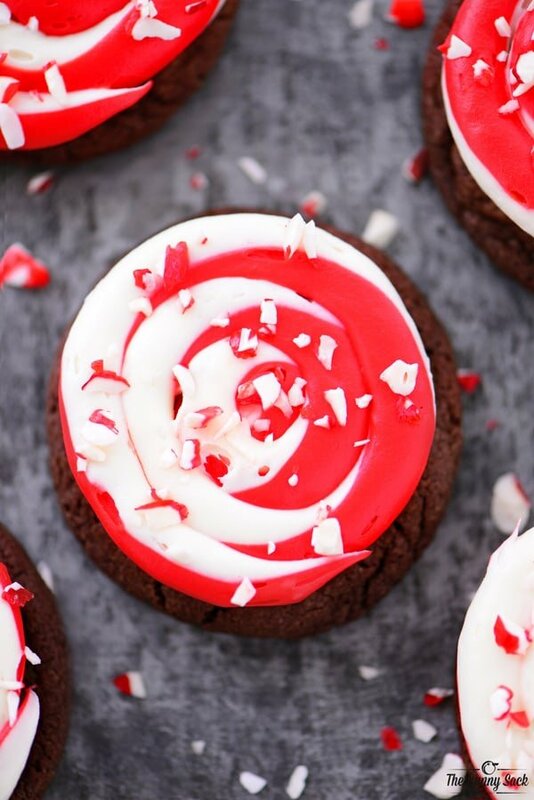 Today I’m excited to share this recipe for Chocolate Peppermint Stuffed Cookies with Swirled Frosting on top. These delicious cookies are easy to make, they look pretty and they are sure to become a holiday favorite! The reason these were cookies are so easy to make is that I used Pillsbury Chocolate Peppermint Cookie Mix, Pillsbury Creamy Supreme Peppermint Frosting, Pillsbury Funfetti Radiant Red Vanilla Frosting and small peppermint patties! All I had to add was a stick of butter and an egg. 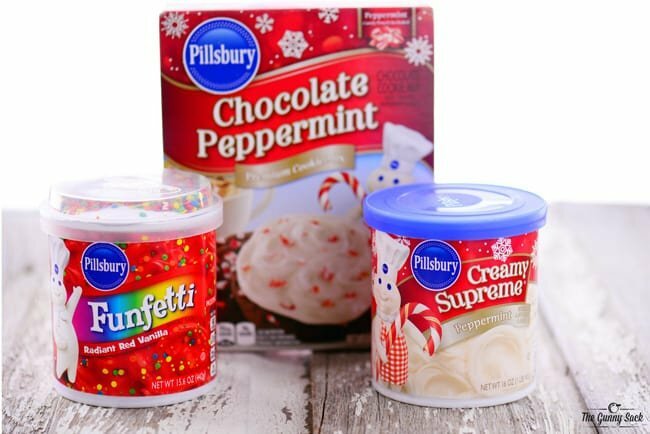 To make the cool frosting swirl, scoop some of the white peppermint frosting into one pastry bag and the red frosting into another. Cut the tips and insert both filled pastry bags into another pastry bag fitted with a decorating tip of your choice (I used a round tip). Squeeze the pastry bag and pipe both the white and the red frosting at the same time in a swirl on the cookies. It’s so simple to do and it makes the cookies look awesome! Sprinkle the frosted cookies with the peppermint candies from the pouch in the cookie mix box. My kids were delighted with how the cookies turned out and said they were so good. We put cookies on plates and delivered them to some of our relatives that live nearby. They were excited to receive a surprise cookie delivery! These Chocolate Peppermint Stuffed Cookies are easy to make, look pretty on a cookie platter and are sure to become a holiday favorite. 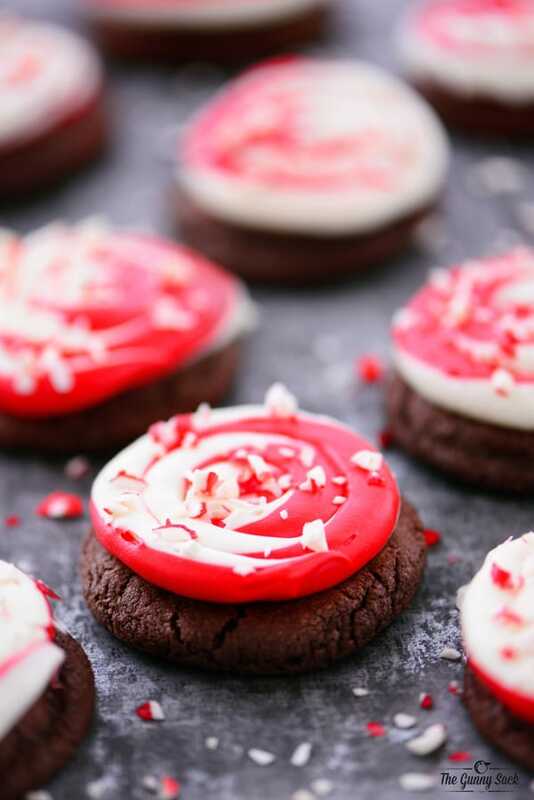 Mix together chocolate peppermint cookie mix, melted butter and egg until dough forms. Use a small dough scoop to make 27 balls of dough. Cut in half and place a peppermint patty between the two halves. Use hands to form dough around the peppermint patties. Bake at 375, on a parchment covered baking sheet, for about 8, until edges are set. (can bake for up to 10 minutes but the peppermint patties might spill out of the cookies). Allow the cookies to cool completely before frosting. Scoop some of the white peppermint frosting into one pastry bag and the red vanilla frosting into another. 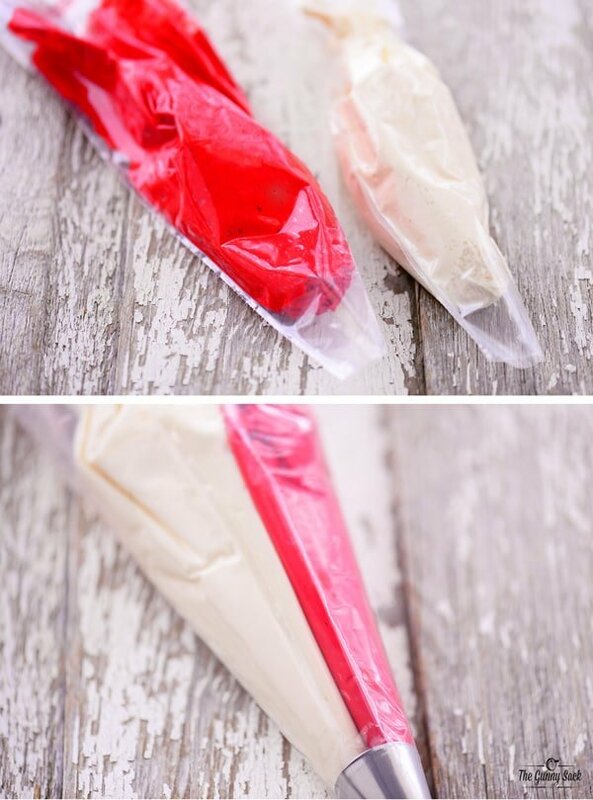 Cut the tips and insert both filled pastry bags into another pastry bag fitted with a decorating tip of your choice. Pipe in a swirls on the cookies. Sprinkle with peppermint candies from the pouch in cookie mix box. I love peppermint and chocolate together, and the frosting just puts it over the top! Great idea to swirl the colors to make them even more festive! That frosting is so pretty! Perfect holiday cookie. Love that fun swirl on top! Love that swirl! During the holidays, I’m all about chocolate peppermint. I’d love to make these with my little nephews before Christmas! I think they’d love them! These are so pretty, I love that swirl! And I agree, Christmas cookies are the best! I love how pretty the frosting is, what a great technique! Boxed mixes are so great for the holidays, it’s nice to keep things easy. These beautiful cookies sound fantastic. That box mix makes it so simple to get started and the frosting really makes them festive. Love!